* Slide finger up/down = changes between lowercase/uppercase/numbers/special characters. * Hovering over a letter for more than 2 seconds activates zoom mode, allowing you to type specific letters without prediction. 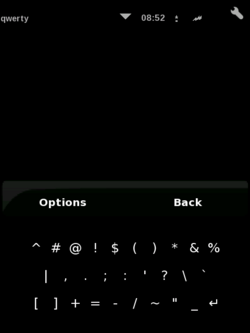 Detailed version: see [[Om_2008.8_Keyboard| How to use the Qtopia keyboard]]. This method retrieves wordlists with lower case words only, not including proper names. This is not sufficient for languages with capitalized nouns, such as german. 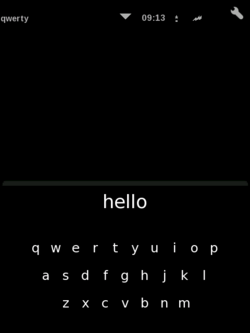 Precompiled openwall words.dawg can be found at: http://alasal.be/openmoko/keyboard . * Now you can choose your language in the upper left corner of the keyboard ! On August 27th 2008, Marek from Openmoko inc. [http://lists.openmoko.org/pipermail/community/2008-August/028152.html announced] the intention to focus on the low-level layers. Future "base system" distribution may not include any phone stack at all.